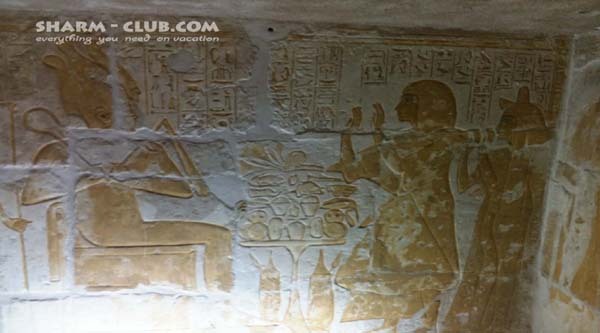 Saqqara is famous for its numerous private tombs of high officials of 5th & 6th dynasties. Now in Saqqara necropolis 6 New Kingdom tombs are open to public after many years of restoration. Do not miss the chance to visit these beautiful tombs of High Officials and Priests. Beautiful wall relief at the tomb of Maya. Enemies of Egypt depicted on the wall of Horemheb's tomb. During the 19th century this part of the desert was explored by tomb-robbers and art dealers, they took many statues, reliefs and inscriptions, as well as minor objects and papyri. Most of these were exported to Europe or America and sold to collectors and museums. No record was kept of the exact provenance of these objects or of the architectural context where they were found. The scientific expedition led by K.R. Lepsius in 1843 was the first to publish some drawings of the monuments from where these art treasures came. A map made by Lepsius helped to relocate the cemetery in 1975. Since then, about 15 tombs have been excavated in this area. As the cemeteries were also in use in other periods in 1975, new excavations started and immediately led to the discovery of an extensive New Kingdom cemetery. It contains the private tombs of high officials of Pharaohs such as Akhenaten, Tutankhamun and Ramesses II (about 1350-1200). Wealthy officials from the nearby Egyptian capital Memphis constructed these tombs. Each tomb consists of a chapel or a temple-like structure built on the desert surface. A vertical shaft leads to the underground burial chamber. The chapel is built of mud-brick or limestone, and generally has wall decoration consisting of reliefs, paintings and inscriptions. Statues once stood on pedestals in the courtyard of a chapel, and a pyramid covered the roof of the central sanctuary. In spite of plunder during the 19th century, the tombs still preserve much of their original splendour. After restoration, they were first opened to visitors in 2011. The major tombs discovered up to that date belong to the following officials. King Tut’s general, who later became King Horemheb and his treasurer - Maya. Maia was King Tutankhamun’s treasurer and was essential in restoring Egypt to her pre-Amarna glory. He helped the king reopen the temples in Luxor as well as build new temples and shrines to Amun to show that King Tut was dedicated to restoring order to Egypt. Although his tomb was left unfinished, visitors will be able to see the mud-brick pylon with spectacular relief fragments, as well as courtyard images of Maya and his wife, Merit, who was also buried in the tomb. Horemheb began building his tomb in Saqqara while he was a general under King Tutankhamun’s reign. During this time, Horemheb would have been one of the most important men in Egypt, as he was responsible for the foreign affairs of an empire trying to regain power after the Amarna Period. After King Tutankhamun and his immediate successor, Ay, died, Horemheb became king of Egypt and left his tomb at Saqqara in favour of a more prestigious spot in the Valley of the Kings on Luxor’s West Bank. All the hard work on this beautiful tomb in Saqqara was not wasted, Haremheb’s wife, Mutnodjmet, was buried there when she died. The tomb is built and decorated in Amarna-style art and the interior design shows that it was meant to be a funerary temple. The details of this tomb, which is the largest in the New Kingdom Cemetery, are fascinating. At the tomb, visitors can see that the Ureaus, or headdress of the king, was added to depictions of Horemheb after the original reliefs were made to show that he had become King. There are also depictions of Horemheb worshiping Maat, Re-hor-akhty and Thoth, as well as scenes celebrating his military victories. Meryneith was the steward and scribe of the temple of Aten during the reign of Akhenaten, who after the king’s death became the High Priest of Aten and the temple of the god, Neith. The “royal butler of clean hands” to both Akhenaten and his son, Tutankhamun was responsible for bringing the king’s food and drink. His tomb bears the prestigious title “The king’s beloved.” The tomb itself is cut in mud-brick encased in limestone and contains three chapels. In one of these chapels, a collection of 56 coffins from the New Kingdom was discovered. Most of them contained the bodies of children who were affected by disease. Tia , as the overseer of the treasury, was one of the top officials under Ramses II. He was married to one of Ramses II’s sisters, also named Tia. Tia’s tomb was used as a mortuary temple to the god Osiris and contains depictions of Tia and his wife making a pilgrimage to Abydos, the cult centre of Osiris. Pay was the harem overseer under King Tutankhamun, while his son, Raia, began his career as a military soldier but took over his father’s post after his death. Pay’s tomb consists of a chapel that opens to a pillared courtyard with three offering chapels. Raia added a courtyard, two stelae and renovated the tomb before he died. The two stela were brought to Berlin when Richard Lepsius discovered them in 1928.